With one season of Distilled Spirits finished, I wanted to recap some of the process and point out some of the ways that I failed horribly. There’s also some fun graphs and numbers for the data fetishists out there. First, I’d like to announce that the web serial will be on a planned two week hiatus, returning no earlier than January 20th. The lives of our four friends, and those in New Portsmouth, of course don’t halt. We’ve left Caitlyn recovering after an overdose and a realization, Geno beginning an ‘official’, committed relationship for the first time since high school, Sidney having just completed a job interview with a videogame developer—outcome unknown, but promising—and Glenn, having decided to forgo his trip to Suriname in favor of helping those within reach. Other ‘breaks’ in the past have been unintentional. Introduced as a weekly serial, it only took 2-3 months for me to appreciate the commitment and dedication that regular content providers put into their work–and to break my original weekly promise. 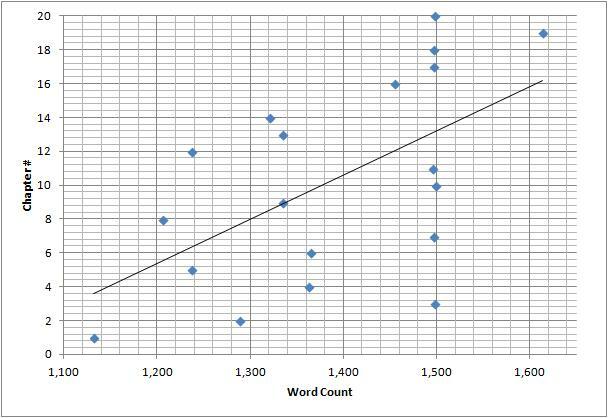 No effort was made to keep each character’s word count similar beyond the flexible 1,500 word cap. With this shoddy, high school quality graph, we can see that Caitlyn’s sections ended up with the most dedicated words. At 8,389 words (29.3% of total), she benefited from being the focus of the only two chapters that exceeded the 1,500 word limit. 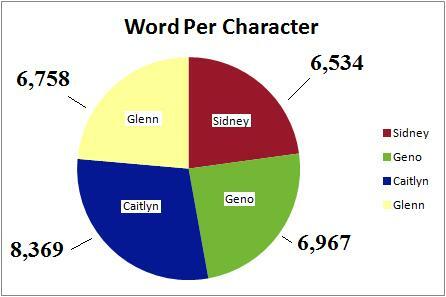 Otherwise, Sidney, Geno, and Glenn were all within ~400 words of each other. Also worth noting: Sidney, envisioned by me as the ‘lead’ protagonist of the four, ended with the shortest dedicated narrative. I’d like to believe this suggests that the serial has a more organic development than intended. One more graph. While playing with all of the data, I found this correlation to be the most interesting. Here we have the relationship between how early the chapter occurred (y-axis) versus how long it was (x-axis). The statistical outlier, Caitlyn’s Halloween Special (Ch. 21), has been excluded from this graph. Even without the line of best fit, I immediately recognized what was happening. From Chapter 1 to 20, the length of each section trended upwards. Did I have more to say? More issues to explore? More confidence in my storytelling? I don’t know. Maybe I was just lazy at first. If I had to guess: I originally underestimated how much narrative would be needed to hit all of the story points and I began slowly. When I began the web serial, I simply wanted to maintain a writing routine. Unless you’re Douglas Adams, it’s much harder to conjure up excuses when a deadline looms. I also had a story that I wanted to tell, most of which occurred in Season 1. And, without the leash of a schedule, I doubt I would have finished a single episode. north of North Miami Seaside.